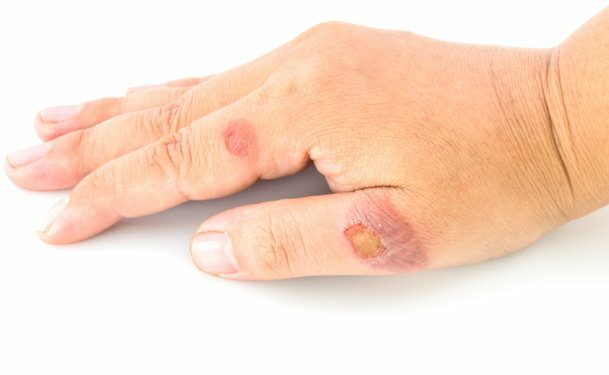 Pyoderma gangrenosum is a rare disease, occurring in approximately one person per 100,000, which causes inflammation and ulceration of the skin. Its incidence is usually associated with systemic diseases in approximately 50 percent of patients. The cause of pyoderma gangrenosum is unknown. One feature is a phenomenon known as pathergy, in which trauma to the skin can cause new eruptions of ulcers in patients with the disease. Two variants of the disease exist--the classic/typical and the atypical variants. These two forms of the disease can be differentiated by the appearance and location of the ulcers. Classic, or typical, pyoderma gangrenosum is the deep ulcerative form that occurs mostly in the lower extremities. The ulcers seen with this variant exhibit well-defined, purple-colored borders which overhang at the margins of the ulcer. A form of classic pyoderma gangrenosum called peristomal pyoderma gangrenosum (PPG) may occur at stoma sites--holes in the abdominal wall where a colon is diverted in certain bowel diversion surgeries. Atypical pyoderma gangrenosum is the more superficial form of the disease. This variant is characterized by relatively shallower ulcers accompanied by vesicles (fluid-filled blisters) or pustules (pus-filled blisters). The locations of the ulcers can be on the outer surfaces of the hands (the backs of the hand, opposite the palms), outer part of the forearms and the face. Other forms of pyoderma gangrenosum may occur in the genital organs (penile or vulvar pyoderma gangrenosum), mouth (pyostomatitis vegetans), or in other parts of the body aside from the skin such as the liver, the heart, bones and lungs. The lesions seen with pyoderma gangrenosum often start as red, tiny, elevated eruptions resembling insect bites, which eventually become large areas of ulceration. They are often described as painful. Joint pains (arthralgias) and body malaise (body weakness) may be accompanying symptoms of this condition. Approximately half of patients suffering from pyoderma gangreosum have other systemic conditions, such as inflammatory bowel disease (Crohn's disease or ulcerative colitis), arthritic conditions such as rheumatoid arthritis, and blood diseases such as leukemia. Although this disease can occur at any age, older patients aged 40 years and above are affected more than younger ones. Aside from daily gentle cleansing and local wound care, there is no specific therapy for pyoderma gangrenosum. In patients with the associated conditions mentioned above, controlling the systemic disorder may alleviate the signs and symptoms of the disease. However, topical medications applied on the affected area to decrease inflammation (such as superpotent corticosteroids, cromolyn sodium, 5-aminosalicylic acid, and nitrogen mustard) may offer some benefit. Oral drugs to suppress the immune function such as steroids, cyclosporine, tacrolimus, myciphenolate mofetil, and azathioprine may also be given. Intravenous therapy using cylophosphamide, immune globulins, methylprednisolone, or infliximab is another treatment option. Hyperbaric oxygen therapy may also be given in other cases. Since the cause of pyoderma gangrenosum is unknown, there is currently no way to prevent this disease. However, the appearance of new ulcers can be prevented in patients known to have the disorder by avoiding excessive trauma to the skin.